Homemade Caramel Corn - Hi, friend Popular Recipes, in this article entitled Homemade Caramel Corn, we have prepared this article well and concise to be easy to understand for you to read and can be taken inside information. hopefully the contents of the post Article baking, Article caramel corn, Article food, Article popcorn, Article recipe, that we write this you can understand and useful. okay, happy reading. Growing up my grandma would always make huge batches of my aunt's caramel corn. She'd give bags of it to all of her grandchildren... we loved it! I'm a sucker for sweet and salty so when Stephen and I were looking for something to snack on, I knew exactly what to make! This caramel corn is really easy, can be made in advance, and the results are always amazing (trust me, I've eaten my fair share of it over the years). However, this was my first time making it, so I was extra careful to not burn the "caramel" and to stir frequently while it was in the oven. It came out looking good and tasting right, so I guess that proves it is foolproof after all ;). I did toss in some roasted peanuts (which makes it more of a cracker jack), some sea salt, and added vanilla bean paste just to give it a little more flavor, which it did. Mmmm! I'll warn you now, this stuff is addictive, it's like cracker jack crack! We're going to be sitting on the couch eating a giant bowl of this waiting on trick-or-treaters. Have a happy and safe Halloween! 1. Preheat oven to 250 degrees. Generously spray or butter one rimmed baking sheet, set aside. 2. In a cold large dutch oven or stock pot with a lid, add oil and pop corn kernels. Coat kernels with oil and turn on heat to medium. Once the first kernel pops (around 2-3 minutes after turning the heat on), place the lid on. Once the kernels have popped and you only hear one every few seconds, remove the pot from the heat. Pour the popcorn into a large mixing bowl (you want extra room to stir). 3. In a small saucepan over medium heat, whisk together the brown sugar, corn syrup, molasses, butter and salt. Bring to a simmer (or a slow boil), stirring often. You'll know the mixture is ready when it reads 250 degrees on a candy thermometer (it will take 5 to 6 minutes). 4. Remove from heat, whisk in the vanilla and baking soda. Pour the mixture over the popcorn and gently mix until all of the popcorn is coated (stir in peanuts if desired). Pour the coated popcorn onto the prepared baking sheet, spreading it out evenly. 5. Place in oven and bake for 1 hour, stirring every 20 minutes. Remove from oven, let pan cool on a wire rack for 25 minutes. When caramel corn has cooled, break up into chunks. Serve or store for up to one week. 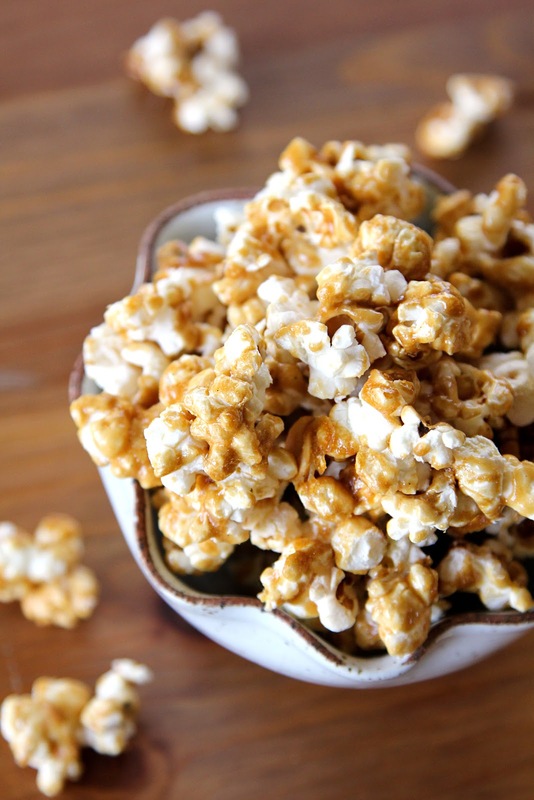 Thank You and Good article Homemade Caramel Corn this time, hopefully can benefit for you all. see you in other article postings.